Jim Anderson to be available on campus to take your senior portrait starting Tuesday the 12th through Thursday the 14th of April. in the Common Room, Second Floor. You must use these sign up sheets to secure an appointment. There are only enough time slots for the entire Graduating Class. No extras slots and no make up dates. Choice appointment times will fill up fast! We need all 3 days to be fully booked to fit everyone in. To get your most favorable time and day: sign up as soon as you can. These are the only dates the photographer will be on campus. Remind your classmates by sharing - Thanks ! May 1st for submitting your own portrait file. Submitted images must resemble as close as possible lighting and background we use. The photo file should be no smaller than 4x6" at 300 dpi or 1200x1800 pixels. There is no cost to you for this portrait sitting and your session will take under 15 minutes to complete. The photographer will shoot a variety of photos and at the end we will review and choose your favorite right on the spot. Remember to come dressed as you would like to appear in the photograph, from the waist up. A mirror will be there for you to check hair and such. Remember that haircut if your so inclined. As a rule there are no rules for dress style. For ideas on style, take a look at past years portraits in the YDS halls. 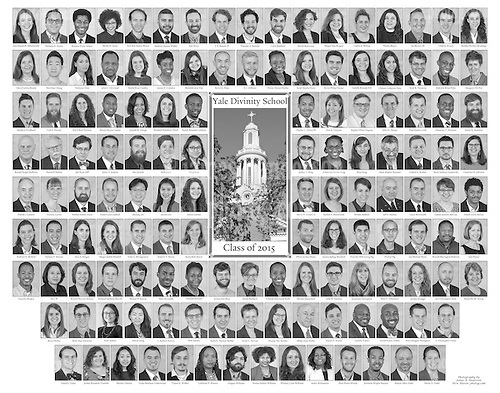 You will receive an 11"x14" professional photographic print of the official YDS '15 photo. It's archival, 200 years they say, and very suitable for framing. It's the same style photograph, with all your classmates, that you see here on this page and will hang in the hallowed halls of YDS. Your print is prepared for and distributed courtesy of the School and available on the Quad at Commencement Worship, Sunday May 17th. You may order enlargements for yourself, your Mom and/or to use in your resume. A variety of sizes from wallet snaps to 13x19" (or even larger if you dare) are available for purchase. Examples of said prints as well as order forms will be at the sitting for your perusal. A web gallery for print ordering by credit card can be set up for your convenience. If you have any questions please feel free to email the photographer, Jim Anderson, directly. He will not have copies of the sign up sheets until he arrives on campus so can not assist in scheduling until the three days of photography. sign up sheets in the Common Room at YDS.